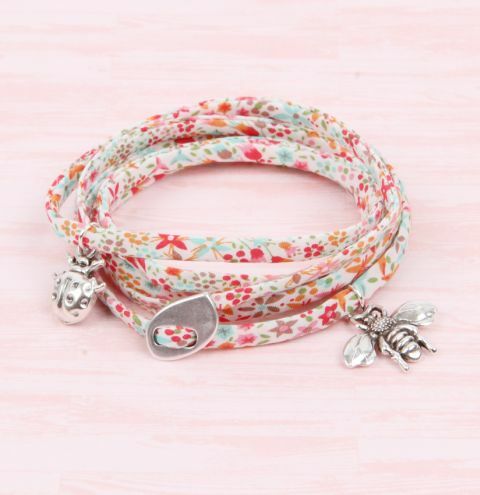 Make a pretty bracelet for Summer with trending floral ribbon and cute bee and ladybird charms! It's the perfect project to add a pop of colour to your outfit, and it's great for little girls too. Fold the tip of the ribbon in half and glue it into the cord end. Allow to dry. Wrap the ribbon around your wrist, and find the two points where you would like to charms to sit. Open a jumpring and thread it through the loop of the charm. Close the jumpring onto the ribbon. Repeat for the second charm. To wear your bracelet, wrap the ribbon around your wrist a few times, thread the ribbon through the cord end and tuck the tail inside the wrap.